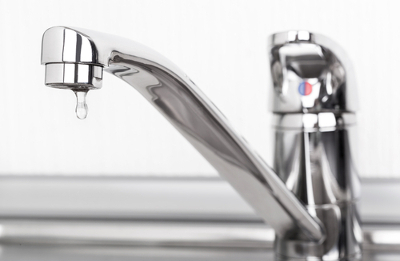 WHAT’S WATER HAMMER — AND HOW DO I FIX IT? Do you sometimes hear a loud “thunk” sound when you turn off a faucet or when the water stops flowing into your washing machine or dishwasher? That’s a phenomenon called “water hammer”, and it’s more than a disturbing noise — it can be the sound of serious plumbing damage. The water in your plumbing pipes is under pressure. When it’s rushing through an open faucet and you turn it off suddenly, the flow of water slams into the closed valve, creating a hydraulic shock. The impact can cause all sorts of problems, including broken pipes, loose fittings and damage to water-connected appliances. The shockwaves from water hammer can also cause your pipes to physically move from the jolt. If they’re not adequately secured to the joists in your home with suitable pipe straps, the moving pipes may bang against your walls, making even more noise and increasing the odds of damage. Unless your home’s plumbing system is very old, you probably already have one solution in place: air chambers. An air chamber is a short length of vertical pipe installed right behind a valve. Because this piece of pipe is higher than the valve, it fills with air instead of water, and the air acts as a shock absorber when the flow of water stops suddenly. Water hammer sometimes occurs at valves that have air chambers installed. When this happens, the cause is usually that water has bubbled up into the air chamber over time, nullifying its protective effects. But fixing this is relatively easy — simply shut off the home’s main water valve, then open faucets at the highest and lowest points of the structure. As the remaining water drains from your plumbing system, the air chambers will automatically refill with air. Reopen your main water valve and check the noisy faucet or appliance to see if the problem persists. If your plumbing system doesn’t have air chambers and you’re experiencing water hammer, you might want to consider having them installed. You could also have devices called water hammer arrestors installed in the same place. The main benefit of an arrestor is that it’s a sealed system, so it won’t fill up with water over time. But the main drawback is that arrestors will eventually need to be replaced, whereas air chambers will keep working for decades. Even with air chambers or water hammer arrestors, you could continue to experience this problem if your home’s water pressure is too high. This is easy enough to check if you have a water pressure gauge, which you can buy for a few dollars at most hardware stores. Simply screw the gauge onto your hose bib and fully open the faucet while all of the other faucets and fixtures in your home are closed. Safe water pressure can range anywhere from 50 to 80 psi, and if your water pressure is above this range, it’s a good idea to take action. One way to correct this is to contact your local water utility to report your high pressure problem and see what they’re able to do. They may be able to send someone to your home to reduce the pressure at the water meter. Another option is to hire a licensed plumber to install a water pressure regulator. As you can see, tracking down the cause of water hammer and even fixing the problem can be a fairly simply DIY exercise. But if you ever need some professional assistance with more complicated steps like installing new water hammer arrestors or pressure regulators, reach out to your local Benjamin Franklin without delay. Water hammer is a serious problem that deserves your attention!